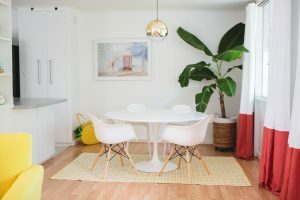 How To Hang Your Curtains Like A Pro | Havenly's Blog! Pop quiz: how do you hang a set of curtains? 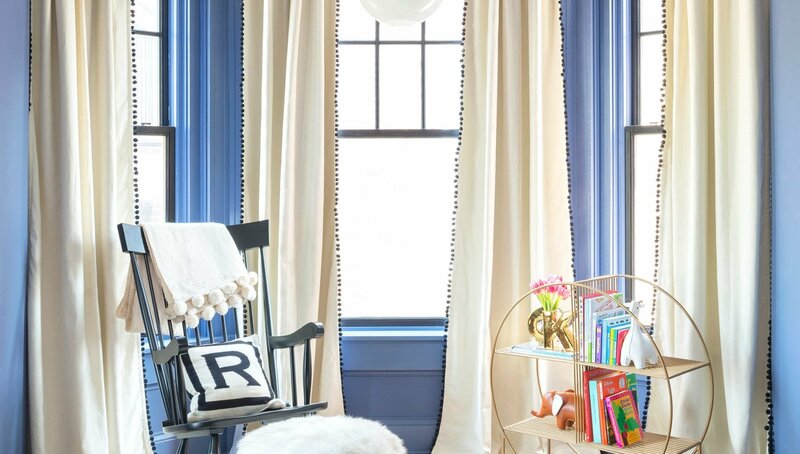 How high should your curtain rod sit above the window? How many panels do you need? What material should you use? Are they “drapes” or “curtains”? Rest easy — we’ve got you covered with our fool proof curtain hanging tips. 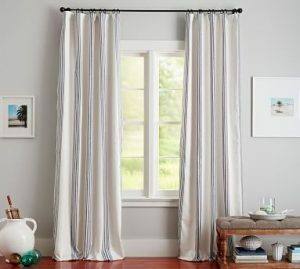 Especially in rooms with low ceilings, be sure to hang your curtain rod as high as possible. When your curtains go to the ceiling, this accentuates the height of the room and helps to draw the eye up. 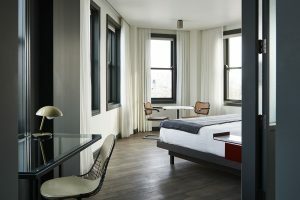 In spaces with tall ceilings, a good rule of thumb is either to hang the curtain rod 8-12″ above the window frame, or about halfway between the window frame and the ceiling. When you open your curtains, you want the panels to just “kiss” the outside edge of the window frame. This allows the maximum amount of light to come through, and it makes your windows feel wider. Aim to hang the curtain rod brackets approximately 6-8″ outside the window frame. Choose curtains in a length that will hang either just above the floor, or just touch the floor. 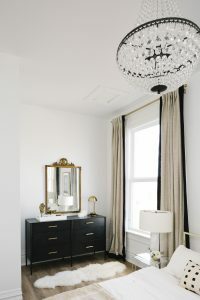 You can “puddle” the curtains on the floor for a more luxurious look — but never, and we mean never, hang your curtains so they hover more than a couple inches off the floor. Where’s the flood? When you close your curtains, you want a bit of fullness so that the curtains don’t look flat. An easy way to determine how many panels you’ll need is to multiply the width of your windows by 1.5 — this is the minimum amount of panel width that you’ll want to cover your windows. So for example, if your window is 60″ wide, you’ll need at least 90″ of panel width. Most panels fall in the 48″ – 54″ range, so two panels will do the job here. 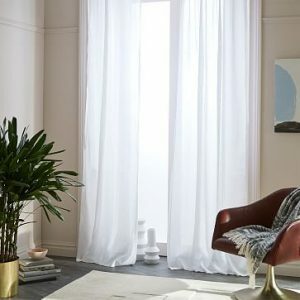 Sheers are perfect for when you want a little bit of privacy, but still want as much light to pass through as possible. Commonly used in main living spaces, these come in a variety of materials and can also feature a subtle pattern or texture. When buying sheers, avoid shiny synthetic materials which tend to look dated — look for fabrics with a dryer hand and a more natural looking texture. Lined curtains offer significantly more privacy then sheers, but still filter light through. 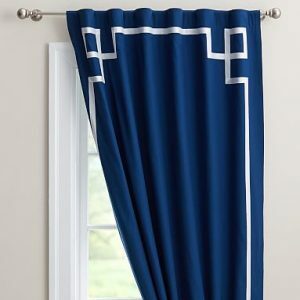 These are also great options if you are concerned about the way your curtains look from the outside — instead of seeing the reverse of the curtain fabric, passersby will see a clean white lining. Blackout curtains are a no brainer for bedrooms or nurseries and either feature a blackout lining (to convert a regular curtain to a blackout curtain) or they feature special fibers woven directly into the curtain to block all light possible. To maximize the light blocking features of these panels, we recommend using curtain rods that are rounded at the edges, so your curtains can completely envelop the window frame when closed completely. Still having trouble with those pesky window treatments? Check out Design Quickie for the answers to all your questions, for free!